Entertaining is made simple with this Vegetarian Charcuterie Board highlighted with three delicious hummus variations: Lemon Dill, Kalamata Olive Tapenade, and Roasted Poblano Pepper. Pair with The Dreaming Tree wine for light fare that you can feel so good about sharing. To roast the poblano peppers, put the peppers under the broiler for 15-20 minutes, turning every 5 minutes until skin is well charred. Transfer to a ziploc bag to steam. Once cool enough to handle, remove the skins and seeds. Rough chop. To make the tapanade, combine all ingredients except hummus in a bowl. This can be done a day in advance and stored in the refrigerator. Put all the ingredients for the basic hummus in a food processor and process until smooth. Divide the hummus to three bowls. For the Roasted Poblano Hummus, blend together the 1/3 recipe hummus, prepared poblano pepper, cilantro, and pepper. For the Lemon Dill Hummus, combine the 1/3 recipe hummus with remaining ingredients. For the Kalamata Olive Tapenade Hummus, simply top 1/3 recipe hummus with the tapanade. 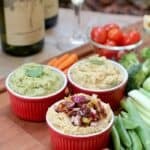 To assemble the Vegetarian Charcuterie Board, transfer each hummus to its serving bowl or ramekin. Arrange crudites, crackers, and goat cheese. Drizzle honey over the goat cheese. Serves 4-6.